About a month ago, I was performing one of my daily rituals. Searching for current work by inspirational artists. I came across a post by the artist Jane Hunt. There are several reasons why I admire her work. One of them is the balance of her mark. Confident bold strokes bordering on abstraction and always with absolute intension. I won't go down the art nerd path and tell you about how I could stare at a single well made brushstroke all day. Rather, I would like to focus on the tools that can help you achieve a great mark. Remember these marks are your signature. The post I was admiring was tagged #rosemarybrushes. This made me curious about the brushes Jane used and how a quality brush could effect my work. I am going to be honest with you and tell you that I have neglected the importance of a quality brush. Over the years I have just gotten by purchasing the least expensive brush possible and seeing them as disposable. I knew it was time to make a change. I decided to contact Rosemary & Co Brushes to find out about there brushes. I had several questions as you know researching brushes can be a rabbit hole. I was really lost in regards to the best type of brushes that I really needed. Studio work, Live Painting with Cloud Cult, and Plain Air are the three main environments I need my brushes to perform within. Both live painting and in Plain Air painting I need to make quick decisions knowing the strength of each mark matters as time slips away. In the studio, the brushstrokes can vary wildly between aggressive mark making to delicate detail with layers upon layers of transparent blends. I was surprised that Rosemary the founder of Rosemary & Co Brushes directly emailed me with some great suggestions on the type of brushes I should be working with. In this era of Amazon style online stores it is refreshing to get a personal response from someone who cares about the people that use there products. Rosemary suggested I order the Bill Davidson Set of brushes due to my use of flats and live / plein air processes. We exchanged a few more emails to determine that these were the brushes for my use. Knowing these hand made brushes were going to be a long term investment I wanted to get a case to carry them in. Rosemary suggested the hand tooled leather brush wrap. That works great on the road or in the field. I completed my order and could not wait to see the products arrive. I was surprised at how quickly the order had arrived considering that these products are hand made and this is a international shipped order. The products were well packaged and I admit it felt a bit like Christmas opening the box. Before shipping Rosemary sent me an email noting that she added a couple extras in the box for me to try out. Again, who does this these days? Simply amazing. These extras turned out to be an additional 6 brushes 3 mid sized long flats, 2 Filberts, & 1 Egbert. Again Amazing! After unboxing I held and felt the quality of these brushes. Ok, I am going to get a little art nerdy and tell you they had a weight to them a quality that really has to be held. My best analogy is the of a musician playing an instrument. A seasoned musician will sound great on a shoddy instrument but, have them play the same song with a well toned, finely tuned, quality instrument and it is life changing. The handles are long enough for making the proper gestural mark making. They have the proper diameter to make you feel that you are holding a brush that is substantial. Providing confidence that you have command of the brush. The bristles have great rigidity with the enough spring to them to help hold shape. The rigidity also really helps with making a well defined stroke. Need I remind you of my obsession with brush strokes. Rosemary & Co Brushes are hand made and are set with gum to hold shape while in transit. Can you tell I am excited about these brushes? The brush wrap was handmade for my order and I recommend protecting your brushes. A properly cared for brush can last years if well cared for. The brush wrap is well thought out. Plenty of space for your complete arrangement of brushes. The hand tooled leather case is inset with a canvas brush holder. I have seen similar items like this but one thing that makes it different besides the beautiful quality is something simple. 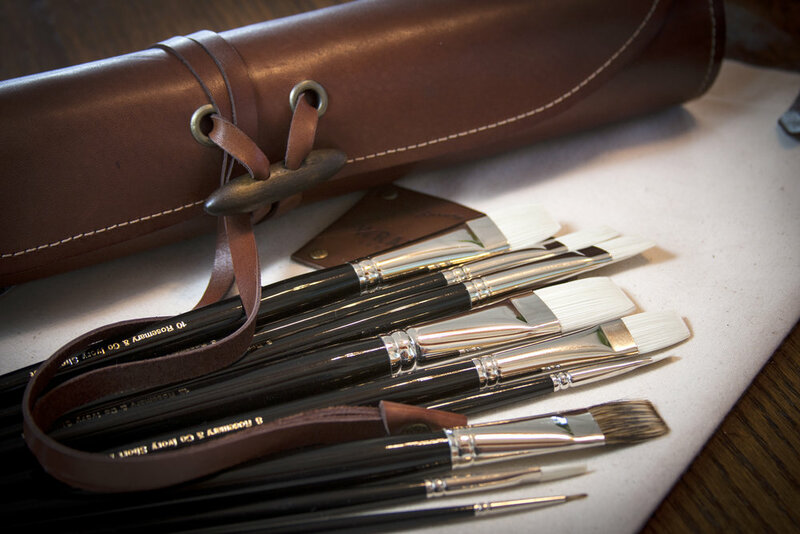 There is a canvas flap that folds over your brushes to keep them contained & protect your bristles. It seems simple but this is a very helpful feature. You can tell this is designed by artists for artists. The quality, well I will just show you some pictures to help illustrate. The complete set of brushes ordered + extras and loaded in the handmade leather brush wrap. I have had limited opportunity to use these fine brushes in my studio but, I will be using these brushes exclusively for the upcoming paintings. I will be updating future posts with paintings created with these brushes as well as how they hold over time. I can tell that these brushes are made to last. They have held up well with the little work I have done with them and admittedly I am rough on my brushes. I will give the final critique on the brushes once they have spent a month in the studio and traveled to a couple of live Cloud Cult shows. A special thanks goes out to Rosemary at Rosemary & Co Brushes. Your mark is your signature so use a quality tools to make your mark. Welcome to my blog about the art making process, providing content about live painting adventures, discussing technique, & giveing product reviews. "Kathryn's Tree" is a gallery-quality giclée art open edition print on 100% archival paper and printed with archival inks. Each art print is listed by sheet size and features a one-inch border. Frame not included. This print is about the journey of love, enlightenment, and trust. "Ascend Together" is a gallery-quality giclée art open edition print on 100% archival paper and printed with archival inks. Each art print is listed by sheet size and features a one-inch border. Frame not included. This print is about spiritual growth and the process of shedding the physical. "The Boabab Tree" is a gallery-quality giclée art open edition print on 100% archival paper and printed with archival inks. Each art print is listed by sheet size and features a one-inch border. Frame not included. This print is inspired by the book The Little Prince. "The Rabbit's Labyrinth" is a gallery-quality giclée art open edition print on 100% archival paper and printed with archival inks. Each art print is listed by sheet size and features a one-inch border. Frame not included. This print is about nurturing metaphysical growth, creativity, and wonder. "Coyote Mystic" is a gallery-quality giclée art open edition print on 100% archival paper and printed with archival inks. Each art print is listed by sheet size and features a one-inch border. Frame not included. This artwork was originally created for the Cloud Cult album The Seeker. The lyric from the song "No Hell" written by Craig Minowa that inspired this illustration is "I saw your soul without the skin attached, and you've got the guts of a coyote pack". "Float to Nowhere" is a gallery-quality giclée art open edition print on 100% archival paper and printed with archival inks. Each art print is listed by sheet size and features a one-inch border. Frame not included. This artwork was originally created for the Cloud Cult album The Seeker. The redesigned print is about giving yourself to the universe.